Adult king (Chinook) salmon spend up to 8 years in the ocean feeding throughout the Gulf of Alaska and the Bering Sea. They eventually will reach their adult size and develop unique adult markings that identify them as Kings. Once they reach full maturity, they return to their natal, or “home stream” to spawn. It is a fact that Kenai River kings are the largest North Pacific salmon in existence; often weighing anywhere from 50 to over 80 pounds. In fact, in the Kenai River, king salmon over fifty pounds are common. It is also a fact that nine out of the ten largest Kings ever caught were taken from the Kenai River. The Kenai is a waterway that produces trophy fish year after year. In fact, the world record king salmon weighed 97 lbs. 4 oz. and was taken from the Kenai by a man named Les Anderson in 1985. In the recent past, king salmon over 100 pounds have been caught in commercial fishing nets near the mouth of the Kenai River. This should remind us that the new world record king is still out there! Not only does Kenai Wild Fishing offer guided king trips on the Kenai but we also offer guests the opportunity to fish the Kasilof River. This drift boat fishery is located 12 miles to the south of the Kenai and flows from the glacier fed Tustamena Lake. We invite guests to experience a peaceful float down a pristine river with lots of fishing action. The Kasilof has 2 runs of kings. The first run begins in mid-May and runs through June. The second run starts in July and runs through the end of July. Most Kasilof kings are between 15-50 lbs. with the occasional trophy. King fishing season runs from mid-May through the end of July. There are two runs of silver (Coho) salmon in Kenai River. The runs take place ranging from the first week of August until the end of October. These fish range from 6-20lbs with the average size being about 10lbs and the larger fish arriving later in the fall. The general consensus on the Peninsula is that the fall is ultimately the best time of year to fish coho. Much of this has to do with the fact that both the king salmon and dipnetting fisheries have ended, and the swarming crowds have dissipated. Silver salmon are an attractive species for anglers to pursue because they are an aggressive and hard fighting species known for their aerial acrobatic displays. Aside from an exciting fight they also make for delicious table fare. These fish will put you to the test with their strength and fight during the battle, they are the most rewarding to catch. We fish both the Kenai and the Kasilof Rivers for silver salmon. 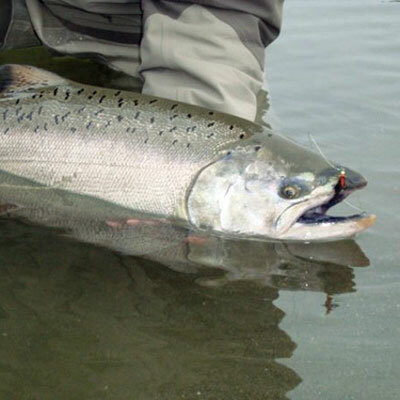 Silver salmon fishing on the Kasilof provides anglers with an entirely unique experience. Escaping the hustle and bustle of power boats of the Kenai for the tranquil “drift-only” waters of the Kasilof has proven to be an adventure on its own. Silver salmon fishing on the Kasilof is special because the Kasilof River is smaller and anglers can get closer to the action. 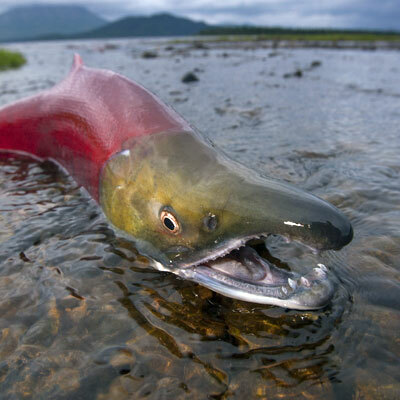 Sockeye (Red) salmon have proven to provide the bulk of the action during much of the Alaskan summer months. Sockeye begin to show up in fishable numbers on the Kenai River around mid- May and will span until the first few weeks in August. There are 2 main runs with a lag of about two weeks between runs, but groups of fish are always moving through the system. The first run will typically consist of between 30 and 60,000 fish, while the second and larger run is estimated to exceed 1 Million. Sockeye have commonly been named the best eating fish in the world; and with numbers in the millions, Sockeye are what you want to fill your freezer with. Not only are they great eating, sockeye also offer anglers an extraordinary experience. With their blistering runs, dazzling acrobatics, and brute strength, fishing for Sockeye will prove to be epic. Usually these fish weigh between 7 -12 lbs. The biggest Sockeye Salmon in Alaska was caught on the Kenai in 1974 weighing in at 16 pounds. In addition to the two runs of sockeye salmon in the Kenai River, there is one run of sockeye salmon in the Kasilof River that we fish for. The run starts around the 20th of June and usually peaks between the last week in June and first week in July. They weigh anywhere between 3-10 lbs. The Kasilof sockeye salmon run averages 300,000+ fish annually. Pink (Humpy) salmon, are both the smallest and the most numerous of Pacific salmon (harvested and canned commercially in Alaska since the late 1800’s.). Freshwater pinks are discernable from other salmon species by the large humps on their backs and hooked noses in males. 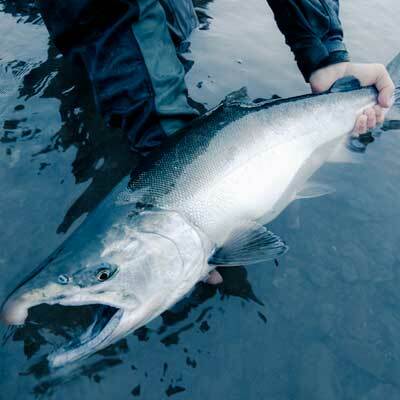 While pink salmon continue to be one of the most crucial of the Pacific salmon to commercial fisherman in Alaska, pink salmon also contribute substantially to sport angling. From 1996 – 2006 sport fishermen in Alaska caught an average of 731,000 pink salmon each year. While their comparatively small size makes them less sought after by sport anglers, pink salmon are excellent fish to catch. 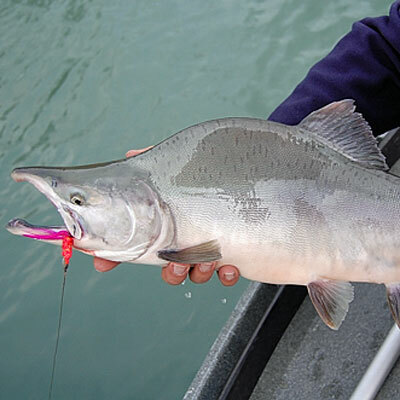 Pinks return to the Kenai River on even years only. They enter the river from late July through late August. Pinks just returning to spawn are known to aggressively strike bait, tackle, and flies. They are also an excellent fish to have children catch because of the abundance of hook ups. It should be noted that when caught in the ocean or near the mouth of the river, pink salmon are also good to eat as their pale flesh has an excellent texture with a mild taste. 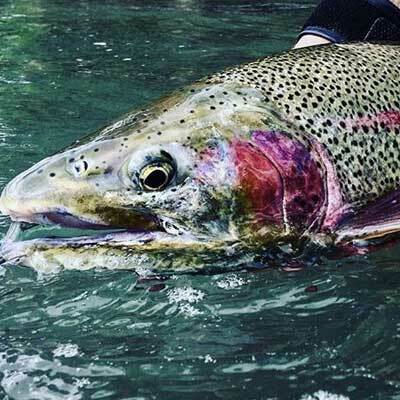 Something that many people don’t know is that the Kenai was first guided as a trout fishery before becoming the world-famous salmon fishery it is today. As a matter of fact, it’s the enormous salmon runs that feed this world class trout fishery. Rainbow trout get sustenance by feeding on the eggs of spawning salmon. Alaska’s rainbow trout are voracious feeders and tenacious fighters. It’s common to have a 10-pound rainbow on the end of your line and behemoths tipping the scales at 20+ pounds have been taken from this illustrious waterway. 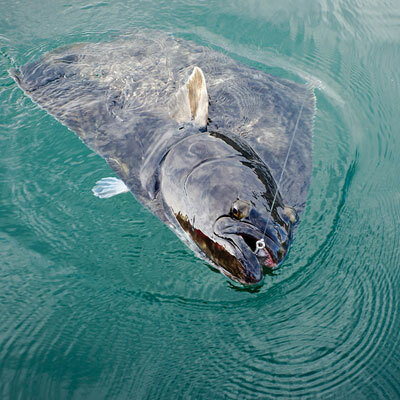 The Kenai River is the place to be for an angler seeking the thrill of challenging this formidable opponent. Dolly Varden is a species that, while often enduring anonymity, also is the fish that provides much of the action on the Kenai. These trout-like fish are available year-round and will make for impressive photo opportunities. Dollies will commonly range from 6-30 inches. 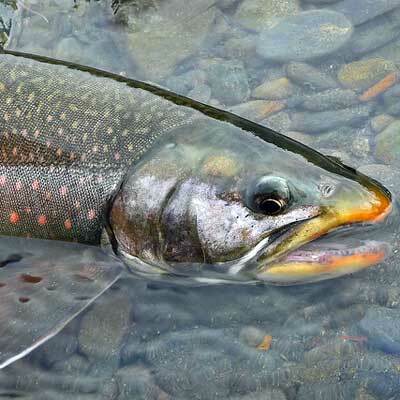 Dolly Varden is one of the most beautiful, widespread, and highly sought-after fish in Alaska. Some spend their entire lives in freshwater while others spend part of the year in salwater estuaries. Dolly Varden are known to come in a variety of radiant hues and with their aggressive instinct, make for a high-quality sport fishing experience. If you need some fish to fill your freezer halibut is pound for pound your best bet. Your trip will not only yield the best table fare around but also a guaranteed spectacular fishing experience in some of the most productive waters in the world. Halibut are easy fish to catch and there is no experience needed. This species of fish is known to live up to around 50 years and can grow to reach a colossal size. Anglers that take a 100-pound halibut are known to have bragging rights and they reach trophy size at 200 lbs. The world record halibut came in just shy of a quarter ton weighing 496 lbs. Halibut can be found in Alaskan waters by departing from several destinations including Whittier (Prince William Sound), Seward (Resurrection Bay), Anchor point (Cook Inlet), and Homer (Kachemak Bay).